Exciting Amenity Renovations Coming Spring 2019! 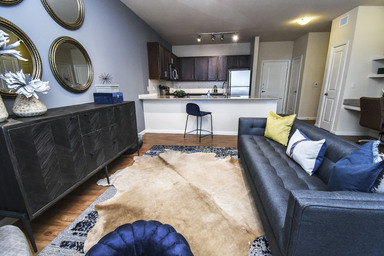 The Landing at Double Creek delivers comfortable, convenient apartments in an ideal south Austin, TX location. The community is just moments from I-35 and the 130 Toll Road, making it convenient to everything Austin has to offer. The features found in these studio, one, two and three bedroom apartments, including stainless steel appliances in the kitchens, granite countertops, Roman-style soaking tubs in the bathrooms and private patios or balconies, are enough to keep you comfortable at home. Community amenities, which include a refreshing swimming pool, an outdoor fireplace, bark park, billiards and movie lounge, balance options for both excitement and relaxation. The studio, one, two and three bedroom floor plans at The Landing at Double Creek are replete with design elements and fine features at every turn, including such luxuries as granite countertops, wood-style flooring and custom brushed nickel features. They all add up to deliver a wallop of style to your home. From a diverse amenity package to its delightfully excellent location, The Landing at Double Creek provides you not just an enjoyable community, but a perfect base from which to explore Austin’s many cultural attractions. Close to home, South Park Meadows is a one-stop shopping and dining destination with over 100 stores spread over one million square feet. Whether exploring Austin or commuting for work, I-35 and the 130 Toll Road will get you on your way. If you prefer public transportation, a MetroBus stop is just moments from the community.